Seventeen years ago, Marshall Ulrich paid a man to pull out all his toenails. Road Runners Club of America Marshall Ulrich, the man without toenails. He's not sure why so many people are fascinated by that fact. "It's not a goofy, freaky thing," Ulrich said. "It was something necessary for me to perform at a level I need to perform." 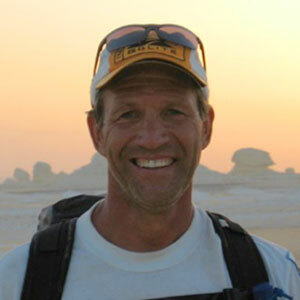 Ulrich is an elite endurance athlete and ultrarunner. He's completed the Seven Summits, including Mt. Everest. He's run clear across the United States -- last year, at age 58, he ran 3,063 miles, the equivalent of 117 marathons; it took him 52½ days. But that's not how a lot of people know him. "I like to think that I've got a reputation as an ultrarunner," Ulrich said. "But what they do is, they hear about this. I'd say an equal number of people know me as the guy with no toenails as from the events that I've done and excelled at. It's kind of interesting." and then keep going? To run 50- or 100-mile races? Anyone who would voluntarily put his or her body through that type of torture must have gone off the deep end, the prevailing thought goes. And permanently removing all your toenails? Well, that just proves it. Despite what you may think, ultrarunners don't see significantly higher rates of injury than runners of distances from the marathon on down. In fact, they experience fewer serious muscle injuries than runners competing at shorter distances, because in running most muscle injuries are caused by speed, and most ultrarunners aren't exactly putting the pedal to the metal. What ultrarunners do experience their fair share of is overuse injuries -- such as tendinitis, Achilles tendon issues, blisters and, of course, bruised and battered toenails. "One of the top problems [ultrarunners face] is the toenail issue," said Dr. Matt Werd, a Lakeland, Fla., podiatrist and past president of the American Academy of Podiatric Sports Medicine. There are many types of toenail trouble. Toenails turn black and blue from friction and wear -- from rubbing against the sock or from hitting the toe or even the top of the sneaker. Blood can accumulate underneath the nail and lift the nail off the nail bed, making the nail prone to falling off. Blood can also pool beneath the nail and cause pressure, which causes pain. Blisters can form underneath the nail. A fungal or other infection can take root in the nail bed. Any and all of these problems can warrant toenail removal, Werd said. But unless they become chronic issues, permanent removal is not usually the suggested treatment. And even then, it's far more common for a runner to have only the offending nails, not the whole set, removed permanently. Kickboxing: Because they get kicked in the shins so often, kickboxers will do almost anything to "condition" their shins. One "conditioning" technique? Taking a wet towel and spending a few minutes thwacking it against your shins as hard as you can. Or, you know, kicking a lot of heavy bags and pads. Your choice. Mixed martial arts: Some cut-prone fighters have taken to having plastic surgery to alleviate the chance of bleeding during a fight. Baseball: Remember the bloody sock? Curt Schilling had Red Sox team doctor Bill Morgan suture his ankle tendon in place rather than miss a start in the 2004 postseason. More commonly, but no less incredibly, every year players undergo Tommy John surgery -- choosing to remove a perfectly good ligament from elsewhere in the body and insert it in the elbow in place of the ruptured or torn ulnar collateral ligament. Football: Before Super Bowl XLIII, the Pittsburgh Steelers' Hines Ward and Troy Polamalu reportedly underwent a procedure called "platelet-rich plasma therapy" in an attempt to recover quicker from injuries. The procedure involves injecting an athlete's own blood -- or plasma -- directly into the injured area, to jump-start the body's repair drive. That doesn't get your blood pumping? Maybe the famous story about Ronnie Lott sacrificing his pinkie to play the next week will cut it. Legend has it that after crushing the tip of his left pinkie finger during a game against the Cowboys, Lott cut the offending digit off in the locker room rather than stop playing. Well, that's not exactly true, but Lott did have the tip of the finger amputated after the season. College football: Picking up where Lott cut off, Trevor Wikre, a Mesa State offensive lineman, chose to amputate his right pinkie finger rather than miss his senior season. Golf: Tiger Woods won the U.S. Open at Torrey Pines on one leg, playing four rounds and a 19-hole playoff on an injured knee. That's all well and good, but Champions Tour golfer Ken Green will play on one leg from this point forward. After suffering serious injuries in a motor vehicle accident that killed his brother and girlfriend, Green chose to have his lower right leg amputated rather than stop playing golf. "Most people don't experience any serious problems with toenails," said Dan Brannen, executive director of the American Ultrarunning Association. "But it is something that happens. I can say unequivocally [permanent toenail removal's] not a trend in any significant numbers." Lisa Smith-Batchen, an ultrarunner and trainer of some renown, said she had lost a few toenails here and there but "not enough to make me want to remove my toenails permanently." Smith-Batchen, who considers Ulrich a friend, said there are too many other solutions available today for permanent toenail removal to be a real consideration, except in extreme cases. Any number of things, from biomechanical review (to ensure the gait is correct and not causing unnecessary problems) to custom orthotics or even a pair of running sandals, could help alleviate the wear and tear on toenails. "I like to say that toenails are overrated," said Dean Karnazes, an elite ultrarunner and author of "Ultramarathon Man: Confessions of an All-Night Runner." Karnazes has had toenails turn black and fall off, but it's never been a serious concern. "Several of my friends have done it, though I've never personally considered having my toenails permanently removed," Karnazes said in an e-mail. "It looks too freaky, kinda like space alien feet." "It's not something that I ever thought was an option," Smith-Batchen said. "But it obviously worked for Marshall." Like it or not, Ulrich has become a poster child of sorts. Mention the words "ultrarunning," "toenails" and "removal" and people will likely bring up his name. For Ulrich, it was all about practicality. He planned on competing in ultrarunning and other extreme events for as long as possible, and he was having hellish problems with his toenails. At any given time, he'd have about half his nails. Every time they fell out, they'd grow in a little higher up and fall out a little easier. It got to the point that his nails were wearing holes in the tops of his running sneakers. He was constantly having to worry about his toenails, and it was distracting him from his running. So, he decided to have a doctor remove all 10 toenails permanently. Almost two decades later, Ulrich is content. "I don't regret it by any stretch," he said. But he's also not in a rush to recommend his course of action to others. When people approach him with questions about permanent toenail removal -- and they do approach him -- Ulrich asks them questions. How serious are the problems? How long do you plan on running? What else have you tried? "I'm just real honest with them," he said. "They hear about it, think that's the cure. I wouldn't recommend it unless it's absolutely medically necessary." That's because the procedure is not a simple solution. First, the doctor has to remove the toenail. (Well, hopefully the first thing the doctor does is apply local anesthesia; if you have the procedure done and that's not the first step, you might consider switching podiatrists.) Then the doctor has to destroy the nail plate, so that the pesky thing doesn't just grow back in and make the whole process moot. Permanent toenail removal is successful about 90 percent of the time; unfortunately, that means 10 percent of people will have their nails come back like Michael Myers in another "Halloween" flick. Other than the possibility of recurrence, though, toenail removal is pretty straightforward. According to Werd, "the nail doesn't serve any function for running, walking or protection, so there are minimal side effects from [the procedure]." To destroy the nail plate, the doctor can apply a chemical (an acid or a base), make a surgical incision to kill the nerve, or even use a laser. After that, it's rip out nail, and repeat. And if that sounds uncomfortable, it's because it is. "It felt like a blowtorch had been taken to my toes," Ulrich said of the experience. "The procedure in and of itself is painful, so it's not a good idea unless it's absolutely necessary." Estimates vary as to how many ultrarunners actually have permanently removed toenails, and some around the sport think it could be as high as 5 or 10 percent. Brannen, meanwhile, said the practice "is not representative of a significant percentage of the sport's participants." While it's a drastic step, it's not an inconceivable one. "I can certainly see why they would do it," Werd said of runners with chronic problems who simply want to remove an impediment to performance. "If you run an ultramarathon or a 100-mile race you've gotta have another mindset to even do that." Still, most ultrarunners will do just about anything before submitting to a permanent makeover of their feet. They study biomechanics, with a trainer like Smith-Batchen. Some runners, like Karnazes, take to carrying a small blood-drawing needle during races, so that if they feel pressure building under a nail they can stop, jam the needle through the nail to relieve the pressure and then continue running. Others go as far as to cut the tops off the front of their sneakers, so their toes have nothing to rub or bump against. or talk to a podiatrist. Ulrich said his toes continued to bleed for close to a month after the procedure, and weren't completely healed for close to six months. "I thought to myself at the time, was this really worth it? But it'd already been done," Ulrich said. Then he paused and, after a second or two, said, "I'm glad that I did it." Jack McCluskey is an editor at ESPN.com.